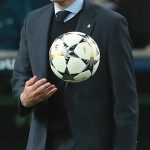 Zidane returns to Real Madrid: stroke of genius or legacy destroyer? By Darren Casserly There’s a saying in football “never go back” and for the most part it’s true. Whether it’s Mourinho at Chelsea or Keegan at Newcastle, the second stint for the most part has only served to sour the legacy. However, saying this, never has a manager returned to the same club after only a few months and after winning five trophies, including three … [Read more...] about Zidane returns to Real Madrid: stroke of genius or legacy destroyer?